Officials Friday released the finalized plan, known as the biological opinion or BiOp. 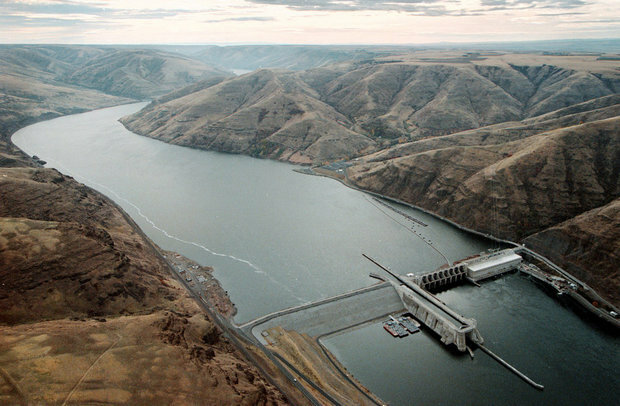 It guides dam operations to assure they do not lead to the extinction of 13 species of salmon and steelhead that are protected under the Endangered Species Act. The plan has been the subject of more than 20 years of legal conflict between people who want to protect salmon and people who want the dams to produce hydroelectricity and maintain shipping traditions. "A major focus of the tributary habitat program is to help us buffer against potential effects of climate change in the system, so that the habitat projects . . . are designed to maintain and protect the cool water inputs into the system," Thom said during a conference call with reporters. NOAA released a draft version of this plan in September. In 2011, U.S. District Judge James A. Redden rejected the plan and asked the Obama administration to consider more ways to recover the endangered fish. Redden's suggestions included spilling more water over the dams to help juvenile salmon safely make it downriver to the ocean, changing reservoirs to help fish passage, and removing the Snake River dams altogether. The case has been transferred to Judge Michael H. Simon. He has yet to set a court date for the plan's sponsors and opponents to argue it. He'll then decide if the plan is adequate to protect Columbia River salmon and steelhead. Now that the previous version of the plan is partway completed, supporters say a trend toward larger salmon runs shows the plan is working. Terry Flores is with Northwest RiverPartners, which represents commerce and industry groups that defend the presence of hydroelectric dams on the Columbia-Snake system. "This plan is amazing. It's the most comprehensive plan we can find anywhere in this country by far," Flores said. Environmental groups say they are disappointed with this finalized plan. Gilly Lyons, with advocacy group Save Our Wild Salmon, said the group is frustrated. "The federal agencies in charge here have re-isuued a slightly tweaked, but largely status quo federal salmon plan that repeats a lot of the same mistakes over the past decade or so that kept them in court and bound them in litigation over these dams and the salmon that they impact," Lyons said. Lyons said it is too soon to tell if environmental groups will file another lawsuit. "With all the stuff that we see in the plan, or that's not there, as the case may be, it sure looks like the federal government would like to go back to court," Lyons said. NOAA officials said there will be a few years before they have to start writing a new 10-year plan beyond 2018. "One main priority is to carry out this existing biological opinion," Thom said. "There will be a period of time between [the 2018 discussions] and the next couple of years where I would like to focus our efforts on talking about long-term recovery. . . . As opposed to focusing either on A) the litigation or B) the details of a new biological opinion beyond 2018."